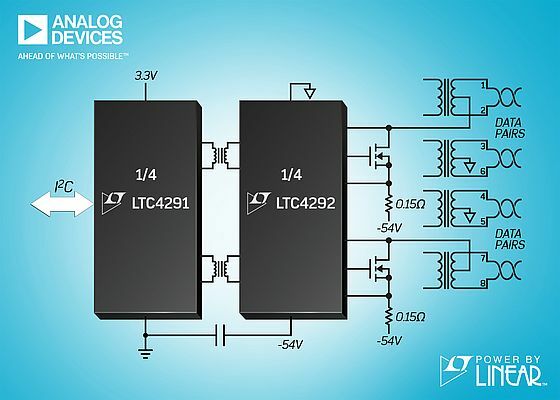 Analog Devices announced the Power by Linear LTC4291/92 isolated 4-port power source equipment (PSE) controller chipset, the first of its kind to pass a series of IEEE 802.3bt (PoE++) Power over Ethernet (PoE) conformance tests administered by Sifos Technologies. PoE naturally presents system and network engineers with PSE evaluation challenges. PSEs are multichannel, intelligent DC power sources that are activated and deactivated through standardized processes without disrupting traditional Ethernet data transmission. At the same time, compliance testing is complicated by requirements to operate over several delivery and polarity configurations. PSA-3202 test blades provides complete automated testing and analysis of LTC4291/92-based PSEs. Rigorous compliance test suites augmented by specialized analysis features validated the LTC4291/92 to the IEEE 802.3at (PoE+) standard, the upcoming 802.3bt standard, and other proprietary specifications. These scalable design and test solutions were built in extensive PoE knowledge and years of experience.